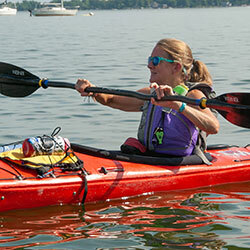 Mary Langlie is a seasoned paddler having guided trips in the Boundary Waters, taught at Sea Kayak Symposiums and with Rutabaga Outdoor Programs. She is a Medical Exercise Specialist and coaches athletes of all ages. When she is not paddling, she runs, does triathlons and plays 'cello. Paddling is more fun when you are physically prepared for the challenge. This fun, interactive session will give you ideas of things you can do during the off-season to prepare your body for the paddling season. All ages and fitness levels will find something in this session that will challenge and inspire them!